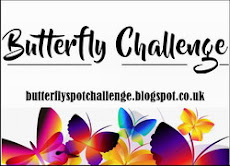 Hi there - and welcome to a new Snippets Playground Challenge fortnight! The Carnival last weekend was absolutely freezing! Blowing a gale and we were only thankful the heavens didn't open as an extra treat! Numbers of stalls seemed to be down this year - and we got off to a slow start on the 'Archery Have A Go', which was a bit demoralising. The parade was such fun - little ones in costume from a handful of schools as characters from children's and we had Harry Potters, Tinkerbells, St. Trinian's which reminded me of school days and various other groups of 'book characters' tripping along wearing the cutest outfits (and little blue noses, bless them). However, things really picked up as the afternoon went on and we had our best takings ever I believe! Wahoo - happy dance that all the trying to keep warm wasn't for nothing. And yes, we were well wrapped up and also under shelter - but try telling that to a determined wind! Thank goodness, my back didn't kick off either - wahoo! - at this point I ran the whole panel through the Cuttlebug using embossing plates and a folder to add the right thickness. A little hint here - Stick-It will move very, very slightly so I recommend you use glue to add the layers together if you intend using the Cuttlebug to squish it down firmly (lesson learned there for me). It wouldn't be a real issue with just one layer of card, but when you've carefully lined up three layers it's a nuisance - OCD strikes again! I really had great fun making this card - the stamps and dies are a delight to work with. And of course, you don't need to add layers - or you could just colour and cut out a few flowers and leaves to add to the corner of a card rather than have the whole panel. Choices, choices! 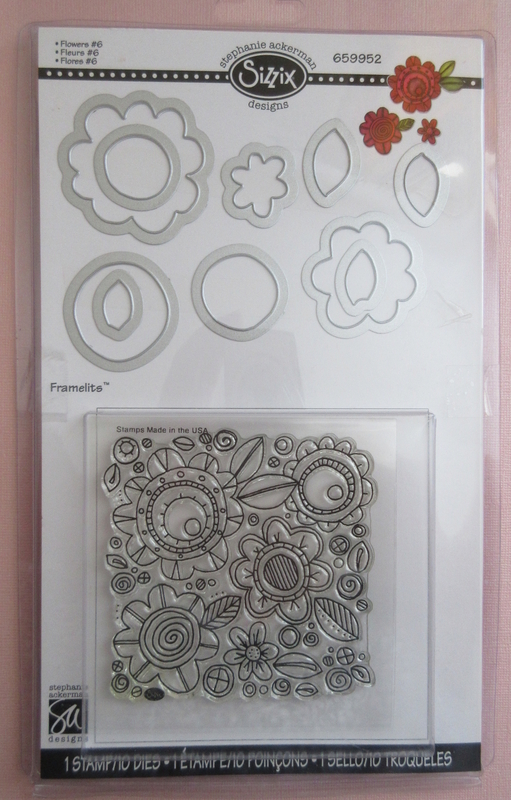 First of all, it's a Sizzix 'Flowers #6' stamp and die set, just like I used for my card today - thank you again Viv! And, I also just managed to get hold of a Memory Box 'Sketchbook Imagine' die from me to add. This was a bit of a mistake really as I did think I had the die sitting in the toy box - but once the card was finished I went to find it to take a photo - and in fact I'd only managed to buy the one for myself some time back (they're really hard to get hold of here in the UK). However, undeterred, I searched on line and eventually found one at Aldridge Crafts (here in the UK) - the very last one they had in stock! Phew. And, Jane who runs the business made sure I got it in double quick time ready for the challenge - and even popped the really sweet set of four hearts die in to add to the prize - it's sitting below the Memory Box die! How lovely was that?! I had other similar word dies in the toy box which would have done almost as well. BUT, I do like the word 'imagine' along with the psychedelic flowers - reminds me of John Lennon's era. Ah, I'm sure I had dresses just as bright and flowery as this card - and, of course the essential white boots! 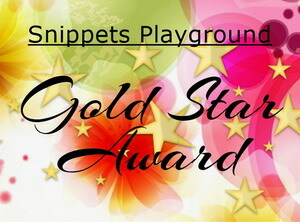 As always, the Snippets Challenge will run for two weeks and the Playground gates will close at 11am UK time on Saturday 7th July. The gates will open again at midnight UK time on the same day. I've thought long and hard but have decided that the prize will not be split at all. As I've previously said, don't be afraid to play along and then if you do win, feel free to give anything away to a friend. It saves me keeping two lists and also saves on postage of course. Besides, I think all three items would work beautifully together. Remember, if you link into the Playground and don't say clearly that you're wanting to be in the draw in a comment on here, then you will be bypassed if your name comes out of Mr Linky. I'm sure you all know I ask for a positive 'yes' on the blog post - just in case you're playing only for fun - otherwise I ignore you on my little list..
Be sure to call back next week to see the winner of last fortnight's Uniko ''Block Party Birthday' stamp. One last thing, I do still have some names on the GD list, and thankfully have a lovely playmate lined up for next week - but, can I please ask you to email me (address on sidebar) if you're happy to be a GD in the coming weeks. My big failing is the inability to plan well ahead and, although I do have about four names 'on hold' they're all wanting lots of notice. Which I do understand of course - otherwise I think we may dispense with GDs and just plunge into fortnightly picks instead. Edit: Initial feedback and some more thinking since this post was published has more or less convinced me that you'd be happy just with the weekly picks and the prize draw result every other week. So, after our next Guest Designer's spot in a week's time, we'll take a little break from it being a regular inclusion. Very busy here right now but I'll do my best to come and see your entries as soon as possible! Wow!! Such fabulous funky card! Love so much how you coloured the flowers and all the layering look just amazing an so dimensional!! What a lovely bright card and well done for adding all the layers - labour of love I guess. I will be posting a card later on and would very much like my name to go into the 'hat' please. It is always nice to have guest designers but I'm sure we would all understand if it wasn't quite such a regular thing - maybe very occasionally. Having the picks every other week would be fine and I'm sure this would make things somewhat easier for you and anything that does that has to be worth trying because you put so much into this challenge one way and another. Lovely inspiration Di and yes I would love to win the fab prize! A super card, bright and cheerful, just like the weather here today......and I now can't stop singing John Lennon's 'Imagine' song! Another lovely prize this week, so I'm a Yes Please for the draw. Thank you for another fun playground challenge!! A fabulous card Di - perfect for the summer! I'll be in the playground later this week and would love a chance to win the prize, please. Di, I love your whimsical card. Please put me on the list for the prize. It would make great snippets for a layout. Fingers crossed!!! What a stunning card. I wish to play and be a possible winner of the prize. Such a bright & cheerful card Di - love it! I'm a 'yes please' for the prize draw. A lovely bright and cheerful card, Di. also had a dress just like it. I do so love flowers!! A super card and a great post. a lot of sunny hugs, we are on our summer holidays. 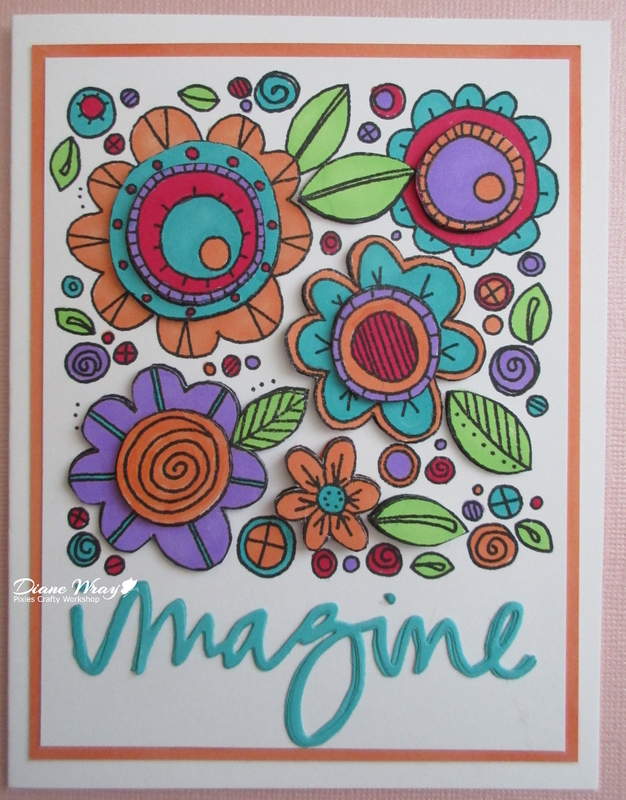 Just playing for fun this time, Di, but oh wow--what a fun, beautiful card you've made! The carnival sounds like such fun & I do wish I'd seen you getting in & out of the vintage car! Hello Diane! Today I am happy to join wonderful challenge again! Thank you so much for chance about awsome prize! Have a wonderful day! Eeek Di!! Your card is so fun and happy! 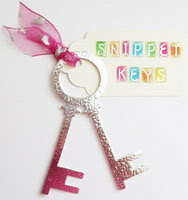 I love the way you stamped it once and then added the 3-D effect with the stamped and die cut centers. All those colors would cheer anyone up. We've been having lots of wind lately here too, but it's been HOT, not cold. I can just imagine all those little kids in the parade, braving the shivery weather and I'm glad it all worked out. Yes please to this awesome prize. I love your card so bright and cheerful. Oh, I really love this sweet, whimsical card that is full of color! The layered bits and pieces add great dimension and interest to a design that is already fun. Great tip to corral the leaf and flower parts so they don't get lost until you adhere them. I'm forever misplacing my small die cut parts before I add them to my card. Half the time I end up having to re-cut the pieces because I never did find the first batch, argh. 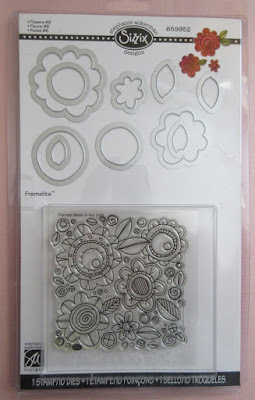 Yes please to this lovely stamp and die set and thanks to Viv for donating such a fun prize. Such a pretty card Di, lovely colours. I would love to have my name added to your draw please. Oh di that card is brilliant - the stamp looks just like the wallpaper I had in my bedroom in my teens, so I really HAVE to go into the hat this week, because if I won I would colour it in the exact colours of my room - bright yellow, bright orange, hot pink and lime green. It's a wonder I ever slept! Oh Jane, I'm really chuckling at this! Only today, in the early hours of the morning when I couldn't sleep, was I going over the carpets and furnishings I chose for our sweet little new build maisonette first home (in a previous life many years ago). We did the bedroom purple on one wall and shocking pink curtains, it was very bright :) But then, we just couldn't run to the extra £300 or so to buy a centrally heated place at that time and so bright colours helped - a lot! Looking back, am glad we didn't go for the central heating as that was one of the things that pushed us to move up the property ladder after about two or three years in the lovely little 'nest'. Love your floral card. Just dropped off a Floral Mandala Note Card. Yes. I would love to be in the drawing for this wonderful prize. Gorgeous, gorgeous card Di amd yes, can see how that snippets would be used up in such a beautiful card.. so yes please Miss, for this..
AND yes, you can see I’ve finally used the Die you gave me, it really makes an easy card and I know I’m going make more with some snippetty cards and this die. I was as said on my post disappointed at the way they put the star in such a way as to not be able to use the top scene in relief from diecut, because of where they place it, why didn’t they use fine wires to attach it. Might be me I’m not sure 🤔 as I’m difficult!!!! Glad you’re hacks okay, love Shaz. Ps you can always call on me at shirt notice as I’m invariably making a card with snippets if you do GD choosing again. Edit backs okay, not hacks!!! Oh, Di, you have outdone yourself on your card for this challenge! It is amazing. And I'd love to win the prizes so that I could attempt to replicate it. Thanks for the chance to do so! This is such a fun and cheerful cards. Love how you've added the layers for extra dimension. It'd be fun to see how this works with printed paper too. I'm a yes please for this prize. What a gorgeous and vibrant card Di - love it! Pity about the weather at the faire, but so good to know you were financially rewarded for your great tenacity :-). Yes please, I wish to play, and be considered for the prize. Fabulous card, so cheerful and FUN!! I haven't been to play in quite some time as it seems life has a way of getting in the way, so I thought I would join the fun here! I will say yes to the prizes (who can resist lol), but really came to join in. Have a wonderful day! 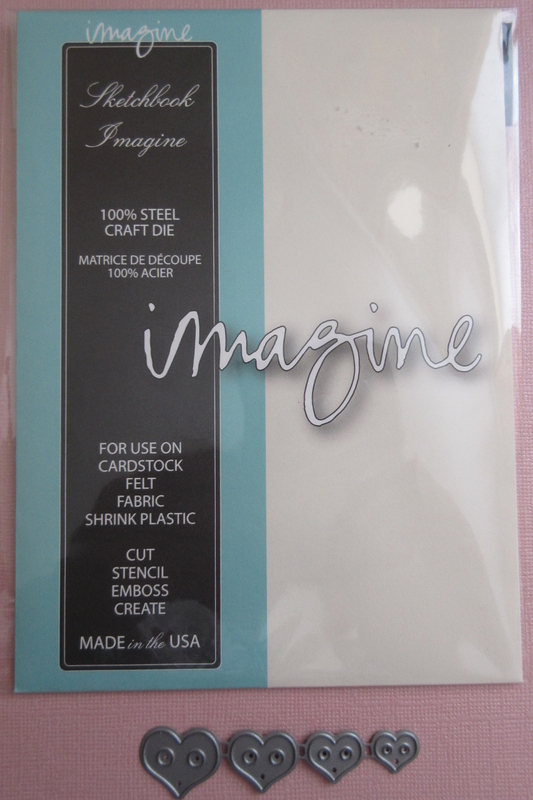 I am entering a gift tag and would love to be the possible winner of the prize. Love your entry, Pixie - it looks so bright and cheerful! Here's mine - and yes, I'd like to enter, please. 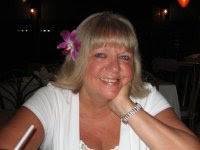 HI Di, would like to be entered into the draw for the lovely prize. Wonderful floral card. Love the colours. Back again after another break...would love the prize!! Love your flower card - it has a cool retro vibe, and those colours are amazing! I finally got my act together and got myself over here to join your linky! I've been making a lot of CAS cards lately with not a lot of snippets, but today I used a cover plate die-cut that was a stencil for yesterday's card and intended to be thrown away; however, I liked it so much that I kept it and made it into a card! Hopefully that's considered a snippet! If not, no worries! But if that works for you, then I'm very interested in the prize! Thanks so much! Love your flowers! I can never decide which I love the best, bold colors or soft colors. Love 'em all, I guess. Yes, please I'd love to win the great goodies this time. Lovely inspiration Di. Such a cheerful card, I love it. And yes, I would love to win the fab prize! Back again with an entry and to say a yes please! Very 1970's indeedy. Our first flat was bright orange for the kitchen with a big flower pattern wallpaper, the lounge was purple and pink, the bedroom pink and green and the bathroom sunshine yellow and we didn't have central heating either just a gas fire in the lounge. Those were the days.!! Yep stick me in the pot this week. Hugs Mrs A.